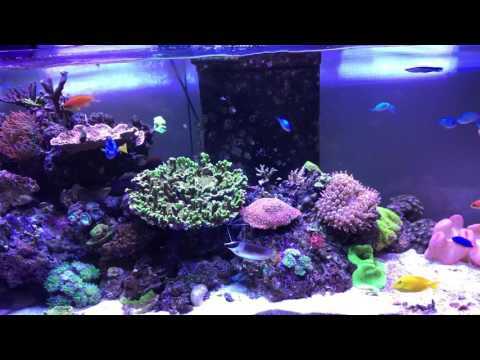 I've been reefkeeing for about 4 years. Made a ton of mistakes and 'got away' with most of them. Got my act together in the last year or so when I figured that the more you put in, the more you get out. Also doing things right first time makes all the difference. But I had to do things the wrong way to learn this. No socks. Big algae bed with amazing cheap light. Small skimmer. Dual reactor with Rowaphos, Red Sea Pro Carbon, Polyfilter. I love the Radions but I can see me going for a T5 Hybrid system in the future. I try and run them as high as possible to get the maximum uptake of elements to create growth. 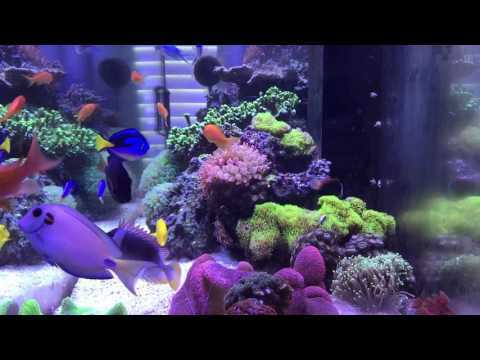 I'm moving house soon so will map the tank's PAR readings using the Seneye Reef to maximise my lights. I keep the MP40s running at 75 Reefcrest antisync for most of the day. So I have a ton of movement in there. I'm basically going for maximum random movement without upsetting anything. I try to keep a happy reef with no fighting. With different species you're always going to get a little chasing - and thats as far as I like things to go in my tanks. I probably have more than the generally recommend amount of fish for a 100 gallon tank, but I'm satisfied that they're all happy and that I can maintain their water and look after their future needs. I have moved on fish in the past that outgrew my aquariums. I have no problem with this. I know that when they leave my aquarium they're in great condition and ready for a bigger tank. The fish are mostly there for my pleasure. I pick them based on suitabilty and comptibility. if they happen to serve a purpose like algae eating/pest eating that's a bonus. 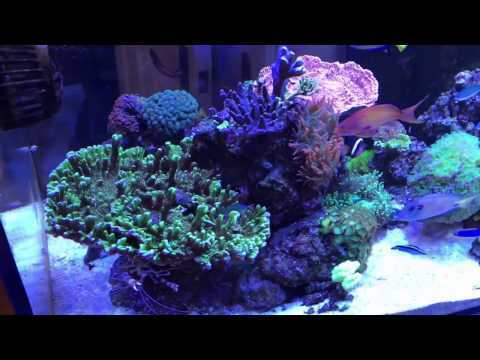 Coral - I live on a small island with very limited options for coral shopping, so I get what I can, when I can. I'm mostly interestd in SPS - keeping that happy is very rewarding. Being a Triton convert I try and keep things in line with their recomendations. Keeping in line with their recomendations is not as straight forward as Triton make it out to be. You can easily find your self dosing elements that you hadn't previously considered would be part of a healthy reef, but you can often notice the difference. Once you have Triton all dosed correctly you can see the differnce in your tank. So I recommend it. The tests are worth the money as they can identify problems that you can't or won't test for at home. I like my nitrate betweem 1ppm & probbaly 3ppm. And Phos as low as poss without stripping it completely. With my stocking though there'll always be a supply. I like to keep my pH as close to an average of 8.2 as possible. I know you shouldn't chase pH but I like to go with the science, and that shows that pH up to 8.3 encourages coral growth. So I run a fresh air feed from outside, into a CO2 scrubber and then into my skimmer. I want minimal C02 getting introduced into the system. It works well and is cheap to set up. I feed a mix of my own food, pellets, flake & nori. My own food is a blended mix of uncooked seafood: squid, clams, shrimp, scallops. I add vitamins, spiralina, algae and nori. The fish love it and lok very healthy. I empty the skimmer cup once a week and clean it. Change my Seneye slide monthly. Scrape the glass of algae a few times a week. Top up my ATU resivour twice a week. Change my Roawphos about every three weeks, regardless of PO4 reading. Change the carbon every month. Strip and clean the pumps and skimmer every 6 months. As I dose Triton Core 7 I dont ever change water. My nurtients are super stable no matter what I feed. I never get a spike. I put that down to having good rock and a thriving algae bed. Moving house this weekend. Going to be very stressful indeed! Green carpet nem wondered into the right hand side MP40. uncoupled the wet side and put on sand bed. Nem has removed itself and buried foot in sand. I'm inspired by the challange of it. I love the methods, the science, the symbiosis that makes it all work. 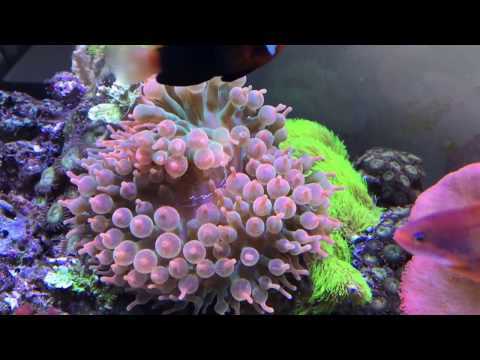 The goal is to perfect my method (as much as possible) and grow colourful coral. I want to see my fish get old and stay healthy.